Ideal for travellers and regional AM listeners. 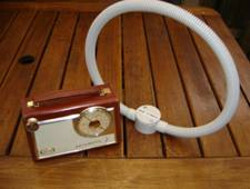 Designed specially for use with Portable Radios and will work with any radio that has an inbuilt ferrite rod antenna. There are NO Wires to connect and it uses NO Batteries or Electricity -True Green Power! It’s easy to use; just place our Tunable AM Loop Antenna beside your radio, tune the dial on top for a Strong signal, then position the Loop for Loud, Clear & Interference free reception! If you're not sure which model you need, just ask us; send an email, give us a call or write, we're more than happy to assist you in getting the best possible outcome ! Do you need an antenna for just one station? Ideal for AM Listeners that don't ever move the dial from their one and only favourite Station. This antenna is custom built and is locked right on frequency for perfect reception every time ! 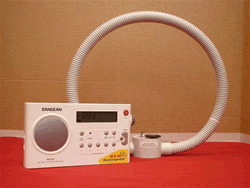 Simply place our Single Station AM Loop beside your radio then position the Loop and the Radio for Strong and Clear reception! Note: This Antenna is ordered for a single AM frequency. We make these also for the Longwave Band !